If you follow me on Social Media it may seem like there's not a day goes past that we aren't going on some sort of exciting adventure and to some extent that is true - we do enjoy a lot of days out and weekends away. I adore going out and about with the kids, especially when the weather's nice but all is not always what it seems. 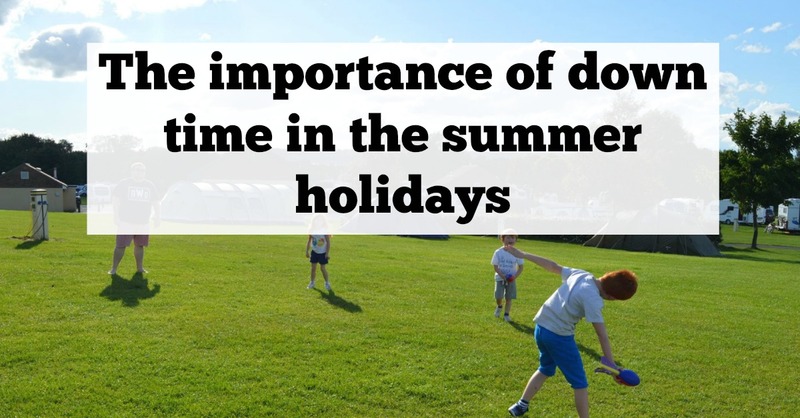 We do spend a fair bit of time at home just chilling out with unstructured play too and I physically plan these days into our diaries as I really think that chilled days at home are just as important as days out. I am just far less likely to post a photo of us sitting at home doing nothing than I am of a nice day out. That's just the curse of Social Media I guess. My parents didn't have too much money as we were growing up. I don't think I ever visited a theme park apart from when my mam's friend took me to Flamingoland. My dad pretty much had a 9-5 job and weekdays in the summer holidays would be spent playing out in the street with friends playing hide and seek around the estate or rounders using the lamp posts as bases. We'd have to do things like walk to the shopping centre and help mam carry the heavy bags back - I seriously cannot imagine doing that with my own kids (you have heard about my Prime habit right). The house I grew up in had a huge back garden and we'd build dens, form clubs, make our own perfume, set up table top sales in the street and pretty much just have the time of our lives. They were definitely simpler times. I have vivid memories of playing with my barbie dolls in our front garden and washing all of their clothes in a bucket of soapy water on a sunny day before hanging them on my mam's clothes horse to dry and before playing sweet shops with the girl across the road from us. Happy days! Back in the 80s we rarely enjoyed a day out during the week in the summer holidays - we just played with our toys or played outside. However weekends were a different matter and we'd always enjoy a family day out when dad was home. Our local haunts would be Ridley Park, Plankey Mill, Hexham Park, Rothbury, Scarborough beach or Ingram Valley - please note that none of these cost any money. We'd really look forward to these days out and enjoy a proper childhood by doing things like swimming in rivers, fishing for tadpoles, building sandcastles and having picnics. I think my own memories of childhood have reminded me that you really don't need to spend money to enjoy quality time together this summer and sometimes less really is more. We do have lots of adventures planned this summer. We're starting off with a jam packed week in Wales which I am super excited for. We do have lots of time at home planned too though and I really believe this is important. My children love playing on their computers and watching YouTube videos - these 6 weeks are their holiday and down time too and there will definitely be days where I let them play on their X Box or iPad for hours on end. If that's what they want to do, I'm fine with that. School is so pressured now and I really want them to have some time off doing things they enjoy. That's not to say I won't be sending them outside to play either. This summer I'm going to make a real conscious effort to send the three of them outside to play in the street and make their own adventures too. Hopefully these will be the days they remember so fondly like I do. I guess what I'm trying to say is that it's all going to be about balance for us this summer and I'm cool with that. There will no doubt be rainy days where the kids are stuck to their devices and I'm sat on my laptop blogging away, there will be days where the kids play out and hopefully rekindle the friendships they made with other children in our street last summer, there will be days where they spend hours using there imagination and building forts or playing with LEGO and there will be days where we head off out and enjoy some real family adventures too. I just need to remember that we don't need to spend lots of money or plan a huge itinerary of activities this summer to have a good one. The main objective for us this summer is to just have fun, spend some time relaxing and enjoying more time together as a family. What about you? This has really stuck a chord with me. My childhood summers were a lot like yours sound. I actually feel quite nostaligic reading this. I haven't actually reflected on my summer holidays and thought about the difference between mine and nowadays. This is my first summer holidays as Arlo has just done his first year at school and I have to say I have felt the pressure to schedule lots of exciting activities and am worrying about money but you are so right, it doesn't have to be about that all the time. Just what I needed to read. I'll be scheduling this on my Facebook. We have just moved into a brand new estate with loads of kids in it...i counted yesterday alone 15 boys and 13 girls all riding round in there bikes having fun..its like when I was growing up in the 80s out early morning home for tea..its fab to watch. We were talking about this just the other day at work. I think sometimes we all do so much as mums and dads because we see others posting on FB and feel obliged to do things too. What matters most though is family time wherever you are. Good at home and making memories out and about too.